Featuring the quote “Good food is all the sweeter when shared with good friends”, this Personalised Good Food Canadian Maple Chopping Board is the perfect gift for the household chef or food lover. 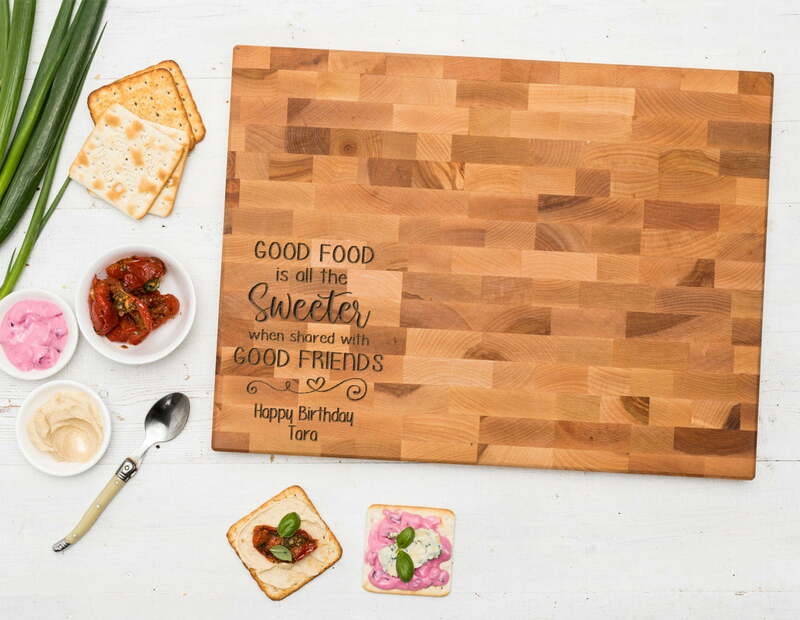 This board can also be engraved with a short message such as ‘Happy Birthday Tara’ or ‘Happy Mother’s Day’. 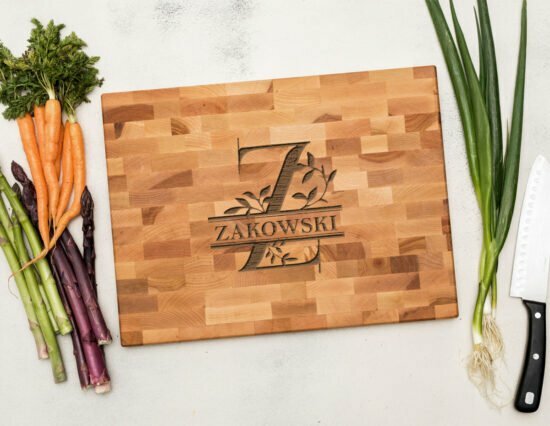 Imported all the way from Canada, these End Grain Chopping Boards boast a beautiful amount of character and colouring. Simply use the ‘Short Message’ field located above to personalised this chopping board. Both board types (Long Grain and End Grain) are made in Canada from Canadian Maple timbers. Canadian Maple is a hardwood timber which is generally light in colouring, used commonly for furniture, flooring and wood working. The End Grain board type option is a result of end grain wood, where the timber has been cut at a 90 degree angle to the grain, rather than cutting a plank of wood the length of the tree, creating a unique characteristic. 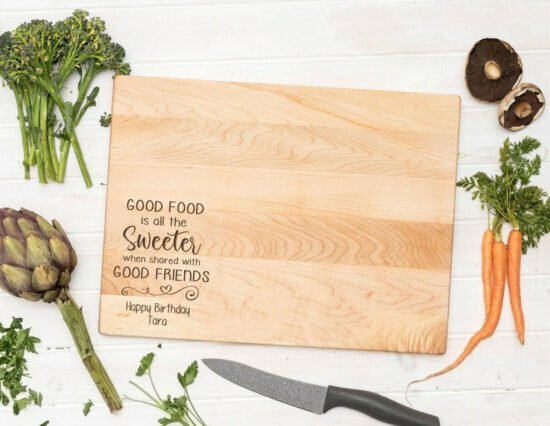 Long Grain; This chopping board measures 40.5cm by 31cm x 2cm thick, weighing approx. 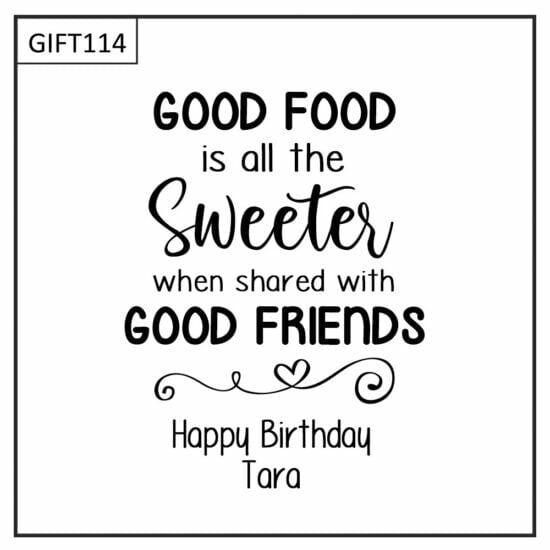 1.7kg. End Grain; This chopping board measures 42cm by 32cm x 2cm thick, weighing approx. 2.4kg. There are cut-outs on both short ends of the chopping board for easy handling.